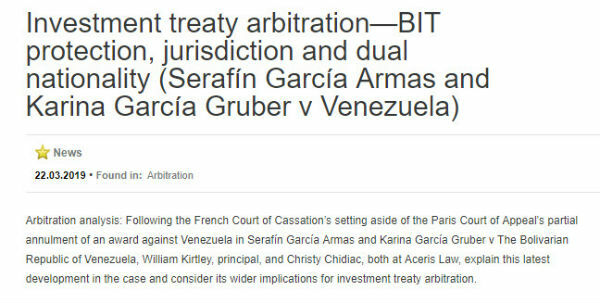 In a recently-published article by LexisNexis, William Kirtley and Christy Chidiac provide analysis of the French Court of Cassation’s setting aside of the Paris Court of Appeal’s partial annulment of an arbitration award on jurisdiction rendered in Serafín García Armas and Karina García Gruber v The Bolivarian Republic of Venezuela (“Serafín“). A primary issue in the setting aside proceedings concerned whether the nationality of the investor should be considered at the time of an investment. While the Court of Cassation remanded the case to the Court of Appeal for reconsideration, the relevant dates to be used were interestingly already discussed by the dissenting opinion in the arbitral tribunal’s decision on jurisdiction. The dissenting arbitrator was of a view that the nationality of the investor should also be considered at the time of the investment. However, because at least part of the investments in Serafín were made after the investors already had Spanish nationality, they would be protected investments in any event and the outcome of the finding of jurisdiction would not, in principle, be changed. LexisNexis’s article is available here. The Court of Cassation’s decision may be found below. Aceris Law LLC is a leading international arbitration boutique law firm that provides legal representation for commercial, construction and investment arbitrations in all jurisdictions. To learn more about this topic, please do not hesitate to contact us.